Keep your hopes low, people. Nintendo has gone and updated their virtual shops again with new games that it's tough to be excited about. Shall we check out this week's additions? Fight your way through hordes of enemies to save Marian. 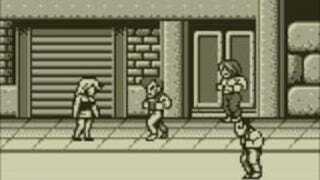 Join Billy as he fights enemies using various punches, kicks and throws, as well as a multitude of different weapons, in order to save his girlfriend, Marian. Many enemies – some with powerful weapons – will try to stop you from reaching the end of each stage, some with powerful weapons to defeat you with, but if you can knock them down, you can make their weapons your own. Various bosses will block your way at the end of each stage, but if you're strong enough and possess the skills to defeat them, the path to Marian will be cleared for you. Can you defeat your enemies and save your girl? FYou've seen them on Nintendo Video... now download them for keeps. "The Pig Who Cried Werewolf," "Night of the Living Carrots" and one more surprise video coming soon, all with your favorite DreamWorks Animation characters, available at the Nintendo eShop. Each video is priced at $1.99. You are a member of a family of military geniuses who came from the Empire, and have lived on a beautiful island for many years. The Empire then arrived on the island and now control everything, and are seeking valuable resources and gold. They have ruined the island's environment and have hunted down and killed the tribal people; some of whom are your friends. You must now stop the Empire and protect your people by becoming a commander and leading your people against the evil Empire. This is a revolution for you and the entire island! You probably know exactly what video games are and how to play them. However, if you haven't played the iFun4all's FishTank yet, you can't really say that you have seen everything! FishTank is a combination of a very popular Match 3 genre with a puzzle video gamestyle. It is an arcade-style matching game but instead of matching gems or blocks you collect shoals of colored fish. In order to do that, you need to build up a combination of four or more identical fish and press a corresponding button to remove them from the net. The gameplay goes horizontally – not vertically as you might be used to.